It's about time I post something interesting. 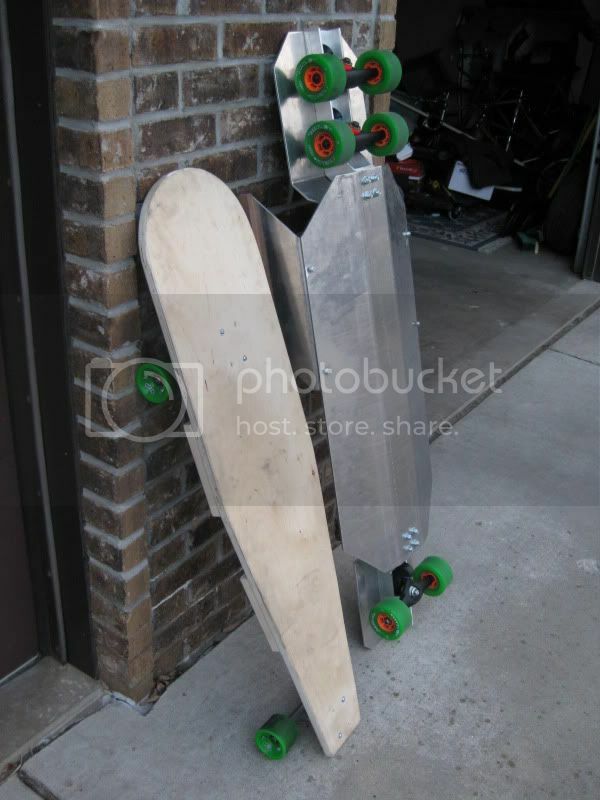 A few friends of mine took up Downhill Longboarding, I followed them by building a primitive Street Luge. 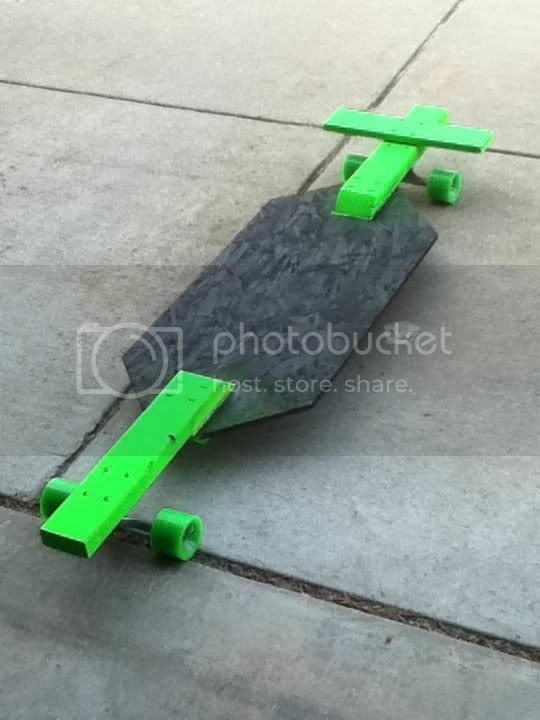 'The Green Machine' After a short season and hitting faster speeds the sketchyness of the board made me take on a winter project building a better one. I now have v2.0 almost complete. Using 6061 Aluminum Channel, and 6061 3x3 Square Tube along with a Pan of 5052 Aluminum. Full image below as above gets cropped. 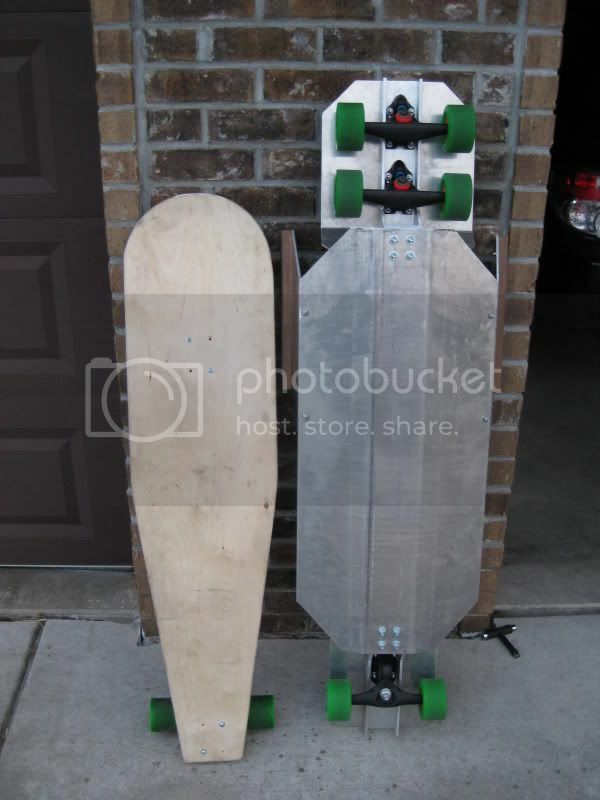 I will be running a 6 wheel setup using Abec11 90mm Flywheels and Veloz Trucks. I'm either going to Anodize it, or send it to be Powder Coated. Not Sure of the colors yet. Note: Retreads next to the shoes. Gloves, New Leathers and Helmet are not pictured. And what you also see in the back is the 1to1 Cardboard MockUp I had made. Cardboard is Cheap to make mistakes with. Aluminum is Expensive. Mocking is a good idea. I actually used 2x4s, but the idea is the same. Unless you have already purchased your wheels I'd recommend going with something like a big zig. They are much cheaper, and will be just as good (if not better) wheel than a 90mm fly. 90mm retail for about $90 while big zigs retail for $50. 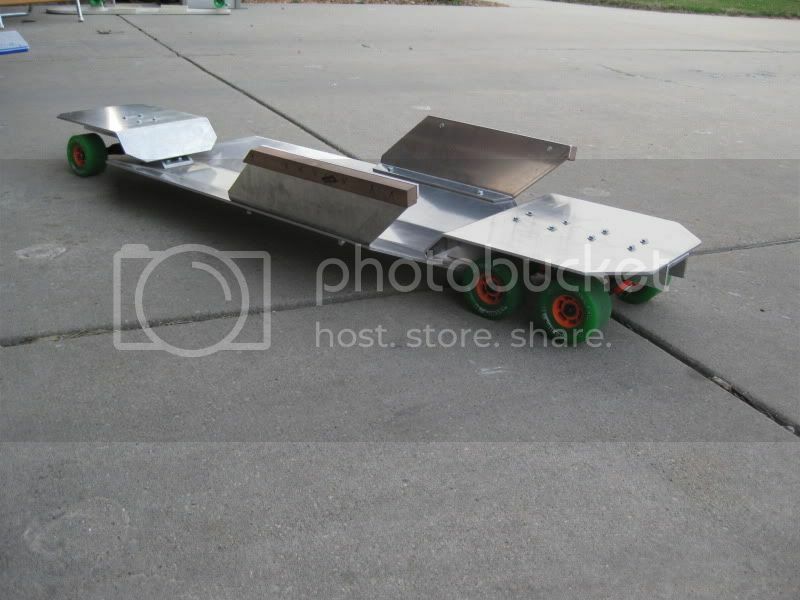 For people who want to build a wood board similar to "the green machine" I would recommend using different plywood for the pan, and probably a 2x2 runner along the bottom. Have you ridden the veloz trucks yet? What are your thoughts on them? I was running Big Zigs on the Green Machine v1.0, when I started building v2.0 I got a good deal at a local shop on the 90mm's I couldn't pass up. So depending on riding style/conditions I plan to switch between them and feel them out. In regards to 'Green Machine' v1.0: It was a complete prototype, I thought I'd spook myself on one of the first big hills I went down. Instead I was hooked. 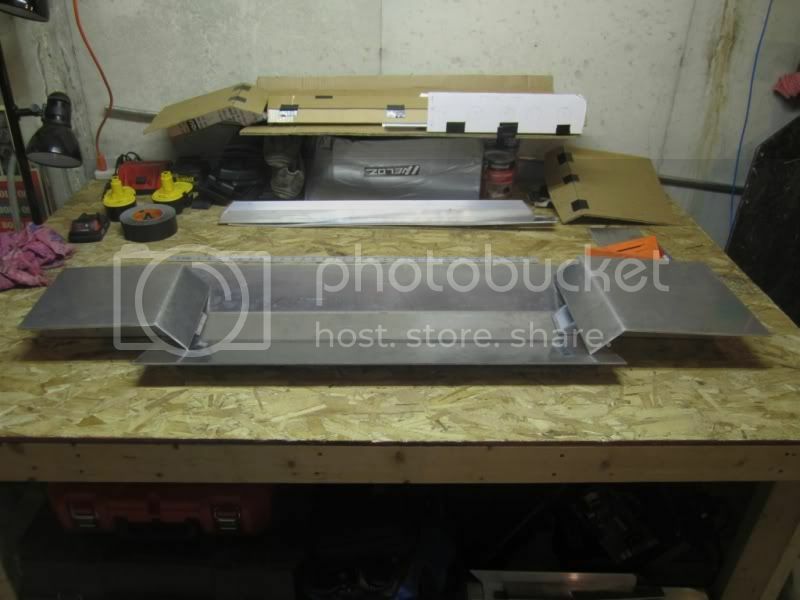 *There is a 2x4 runner underneath the chip board pan (Hard to see in the picture, but it is bright green. A corner is visible on the rear section). It was all carriage bolted together using (4) carriage bolts on each end. The lack of handlebars and the sketchyness of my quick construction motivated me to get serious. I would suggest putting a chamfer on the corners, but looking pretty nice so far. WELL... My project is slowly making its way to an end. 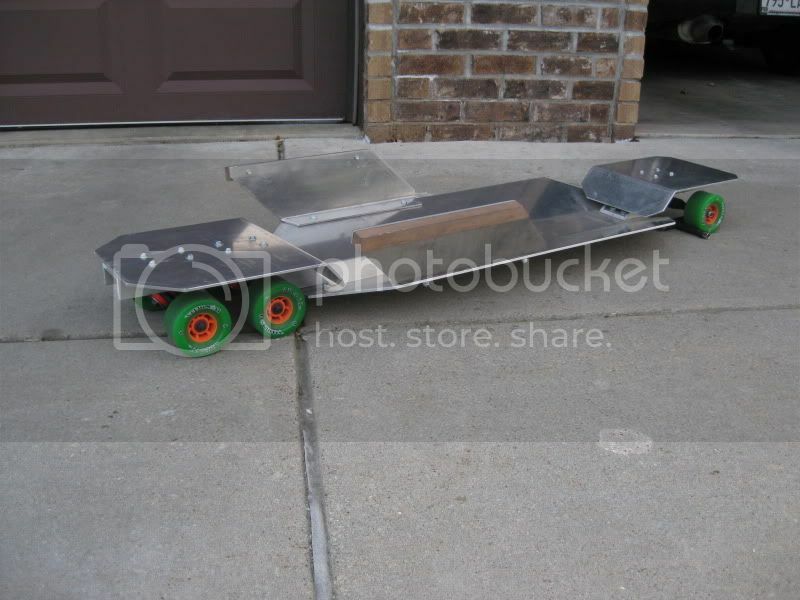 It has been a blast seeing it come full circle from plans I found on the web to a 1:1 Cardboard mock up then to Full Scale Aluminum Sled. I have a few things to finish up but at this point it IS 'streetable'. ToDo: Headrest, Auto Trim Molding, Bumpers, Color and Fine tuning. (Bushings/ride height/stronger hardware...ect) I made some 3/4'' and also 1/2'' risers just in case out of some UHMW I had laying around. I had some old hardware from v1.0 so I built a 'Classic Luge' as well. I can throw this in my car and randomly hit a hill if I see one while on a drive. The classic is nice for walking back up the hill with because the Aluminum Sled is a beast to carry all the time. It has been very fun sharing and learning from this community. All have been helpful and supportive when questions and concerns arose. I'm not done, I'm not going anywhere, Just Thanks to all. I think though your handles come too far back. It is a little hard to say without seeing you on the board, but you don't really want the end of the handles to come past your waist. It can make it difficult to turn. I agree with Chris in that it looks like the handles may be too far back. You might also try to mount the front trucks closer together and might need some under pan support to add rigidity. My classic luge is my favorite ride for most daily excursions because it's lighter and easier to handle. Arg... The handlebars are a touch late too completely fix completely now. I hesitated when I 45'd the corners of the pan. Live and learn. Marking it down for the future. Thanks. In regards to the rigidity, I have some 6061-T6 Aluminum Channel 3" x 1.5" x 48" to add to the bottom if need be. But the pan is 3/16'' thick and the bends I added to it make it pretty strong. If I detect flex, the rail will be added. I'm a weekend warrior and still in the learning process. Mostly non technical straight runs down hills for now max speed topping mid 40's. I was Just getting into 'fast' corners not braking and sliding/drifting with v1.0 but this new machine is a whole new animal. Last edited by DefectiveProduct on Thu Mar 22, 2012 8:42 pm, edited 1 time in total. The closer you get the trucks together the less tendency they'll have to fight in the corners. You're running a zero degree trailing axle rear, you won't need such stiff bushings. In fact you will be surprised at how soft of bushing you can use with no stability issues. On my classic luge (my street luge is currently undergoing modification) I'm using Khiro gold insert cone bushings both sides; 92a boardside, 90a roadside in the front. I believe I can go softer roadside, but don't need to. The rear is currently using the stock Veloz bushings. I am also 230 lbs. My street luge will likely use softer boardside bushings. Risers are mostly used to keep your luge from scraping the ground. But you can add risers to raise your CG and increase leverage over the trucks. Thanks. I will be experimenting with different bushing duros in the near future. Note the *Clarification on the rear. Now what's the difference between the feeling of a barrel vs a cone? Small/Tall? Aluminum inserts? Or am I getting into trade secret stuff here. A lot of the descriptions are the same with no REAL info. It's great to get this kind of feedback from someone similarly fluffy. For the same duro barrels tend to be more stable and increase in resistance more rapidly as you lean whereas cones are more responsive and have a more linear resistance as you lean. For a zero degree rear set up I see no need to have any barrels on any trucks. You might try barrel boardside for more off center stability, but I like a more responsive setup. I believe my setup, with softer conical bushings is as turny, if not more so, than a standard setup. I ride with my teammate regularly who runs a standard rear truck and our turning performance is similar. we've even swapped boards and in my experience the feel in the turns is similar, but the zero degree rear is much more solid in the straights; it doesn't have a tendency to wander. I hear that aluminum/gold insert bushings are more precise. What I like is that they don't require washers and fit the kingpin without slop. Tall cones compress less in percentage per degree of lean than short bushings. So, off center the tall and short cones should feel similar, but as you lean the short cones will become more restrictive. You might consider wedging the front trucks. I currently use a 65 degree front truck on my classic luge. On my street luge I plan on wedging them a bit higher. If you're just going down mostly straight roads with sweepers the standard 50 degree fronts will probably work, but when you get to more technical roads you might want a bit more steering out of the front. Always happy to answer questions: I have no magic dust. I was planning on keeping the zero degree rear secret, but most racers don't even read this forum, and almost nobody believes me that the zero degree rear setup can actually turn. Powdercoat or Anodize with multiple layres of clear? I think powder coating is more durable, although it can chip. Anodized trucks look amazing and will probably look better for longer, as they will tend to chip a bit more. Meanwhile I've powder coated my board and it still looks pretty good. I don't know what the cost difference is between the two. I am no judge of function, but the construction looks pretty clean. I see more powder coated luges than I see anodized ones and I think that's for a number of reasons: cost and availability. Almost anyone with a modicum of painting knowledge and the proper equipment can powdercoat... heck you can buy almost everything you need at Harbor Freight Tools minus the oven you'll need. I've powder coated small things, but nothing the size of a luge, using my home oven. It smells though. However, Anodizing is a bit more complicated requiring chemicals, and mixing water and electricity (not something I recommend you do at home unless you're a very careful, safety minded and meticulous person). Anodizing will be more durable and long lasting. I'd say check around and get some price quotes. If you want to try your own hand at either there are quite a few DIY articles on both online. Just be careful: wear particle/gas masks, gloves, and full clothing with either process.